Since many of you may be wondering about what sort of preparation goes into planning to study abroad, I thought now might be a good time to give you a run-down on everything I’ve done for this trip so far. First, I researched study abroad programs, then applied to the one I was interested in. Many people hedge their bets and apply to more than one program, but I knew that I met all the criteria and the application process is fairly time intensive, so I opted to bet all my chips on one hand. After waiting forever to find out, I was finally accepted and even offered a small scholarship. Then came the real work. In the US, it is the private schools.. the Harvards, Yales, and others that are tough to get into. In Costa Rica, however, there are only three public universities and those are the ones where the competiton for entrance has become tough indeed. Me neither! However thanks to alert reader Julie Becker, I now know we have another nasty thing available in Costa Rica. B. You’re going to have to live in some pretty nasty places to get it! Your chances of catching Chagas disease are truly remote unless you’re into living adobe style. Because it is pretty near impossible for the average person to get Chagas, I almost decided against adding it to RCR. In fact, unless you’re a Peace Corp volunteer or living with the indigenous people of CR, you’re pretty safe. 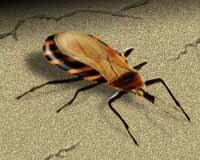 Still, as I want our section on Disease in Costa Rica to be as complete as possible, I have added Chagas to the list of things that can be a downer while visiting or living here, including all, and probably more than you ever wanted to know about this disease. So you travelers planning on switching your reservations from The Four Seasons to a some mud shack or adobe, better read about the whole thing in the section on diseases. Those of you who prefer a somewhat higher standard of accommodations, well you can pretty much ignore this whole post.